UPDATE: The Marine Corps Times cover story on the IAR is now posted online here. The M27 Infantry Automatic Rifle was approved for full fielding recently by Commandant Gen. Jim Amos. Marine Corps Times profiled the decision in its print edition last week, outlining what it means for each fire team, rifle qualifications and the gear Marines bring to war. The decision is a big deal to the Corps, but until now, no photographs of the IAR in Afghanistan have been released. That’s where Marine Corps Times photographer Tom Brown comes in. Below, you’ll find images shot on patrol last week with 1st Battalion, 3rd Marines, out of Marine Corps Base Hawaii. It’s the first battalion to take the IAR to war, and senior writer Gina Cavallaro has a feature on it in this week’s print edition. Lance Cpl. Kendrick Johnson, of Alpha Company 1st Battalion, 3rd Marines, holds the new M27 IAR during a June 23 patrol in Garmser, Afghanistan. I think this is a smart move. The SAW seemed to be a redundant concept when you already have the M-240 as an adequate suppressive fire system. Couple the new IAR with some high capacity magazines and you get the best of both worlds; high rate of fire and a lightweight non-cumbersome weapon. 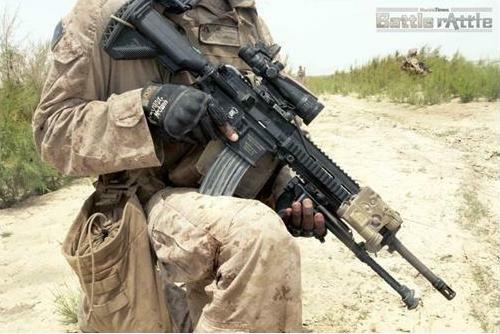 That Marine needs to move his PRC-153 to his non-dominant shoulder. Not going to be able to get shots off w/ any accuracy with the buttstock on your comm gear. Come on, Lava Dogs. Well the SAW is not redundant as you don’t always have a 240. However my problem with the SAW was how unreliable they are. If they can fix the 30 round mag issue with at least 100 rounds then this would be a welcomed change in my opinion. Carbine, we’ve heard the concerns about the beta mags, too. As for the UBL cash-in thought, HK landed this contract long before he was killed. The Corps picked it in a down-select in late 2009. There’s no quick-change barrel on the IAR, so that will remain a question for now. The Corps is banking on more accurate fire taking care of its needs. Yeah, the Beta mag is old news, most people are theorizing that Surefire is trying to get a contract with their casket 60 rounders. As for the barrel, it cannot be changed, but apparently, its good enough to maintain a fire rate of 65 rounds per min vs the m249’s 85/min. 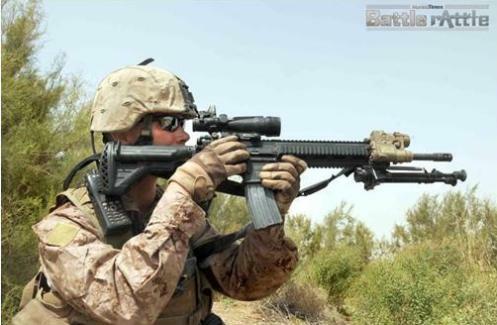 However, Marines are currently being trained to go semi auto with the m27 until they get within 100m when they switch to full auto suppression…. Something tells me they’re trying to go back to the concept of the Browning BAR with the 2 man fire support teams, and a low rate of aimed, suppression fire. As for performance, we just have to see what they do with it. In the article on the Infantry Automatic Rifle (IAR) Marine Times stated that the system will not function with the polymer “PMAG” from MAGPUL. While this is a correct statement, due to the angle of the IAR magazine well, Marines may use the MAGPUL “EMAG” which will function with the IAR and M-16/M-4 rifles as well as rifles whose magazine wells conform to North Atlantic Treaty Organization (NATO) Standards of Agreement (STANAG) requirements. Furthermore, I question the logic in not letting Marines assigned the IAR the ability to qualify with the system. It seems that this is based on the superior accuracy of the system and is a moot point. The IAR which was based on the Heckler and Koch HK 416 should be fielded to ALL combat Marines. It is perplexing to the educated end user why you would only provide a more accurate and reliable system to one Marine per Fire Team. This would require little more than exchanging the Buffer and Buffer Tubes on existing M-16/M-4s and replacing the current upper with that of the IAR. There are some detractors who will say this is not feasible. However, the HK416 (which the IAR is derived from) were initially developed inline with United States Special Operations Command (USSOCOM) assets as an improved reliability upper for the M-4 and was originaly fielded as such. In addition, the IAR is often test fired on United States Government Issue (USGI) compliant lower recievers by the manufacturer. Marines (although not as of late) are a force that operates “From the Sea”. With this in mind, one only need observe the “HK 416 vs M-4 SOCOM Over The Beach Test” video to realize the benefit of the IAR in this realm as the M-4 suffers a catastrophic and potentially fatal failure when submersed in water. A scenario which is very likely to be encountered by Marines prosecuting opposed beach landings or traversing canals while engaged in combat in Afghanistan (just like in the pictures). I know there’s some “Requirements Officer” probably thinking: “We don’t have a requirement to fire our weapons from the water”. Well then, would you please enlighten me to the reasoning why Marines have a requirement to swim? While I don’t believe the IAR is a replacement for the M249 Squad Automatic Weapon (SAW) in all aspects of infantry operations, it is a viable replacement for the M4/M16 Direct Impingement (DI) uppers. However, as history has shown us, this won’t happen and will be explained away by some fuzzy logic that can only be understood by a logistics officer. Replacing the SAW with a weapon that has a slower rate of fire, is magazine fed, and has no barrel change capability is a huge mistake. Even with a 60, 100, or 200 round mag the Marine will not be capable of sustaining the rate of fire the SAW is capable of. Furthermore the Marine will basically be reloading for most of the fight, which will take his focus off the threat and negatively influence his accuracy. Interesting since accuracy was a big reason this weapon system was implemented in the first place. I would think that the Marine would also become fatigued in Reloading so often that the weight savings of this weapon is largely a moot point. The Marine Corps should have implemented a new training program to teach SAW gunners how to engage more accurately with the SAW. It seems that the Marines now have a fully auto M16A4 performing with a piston system performing suppressive fire duties……not a good thing. This is the dumbest thing the Marine Corps has done since the MOLLE pack. It ranks right next to the Army and there ACU camo as the worst ideas ever! O.K. all you experts including the senior staff writer. First issue…The IAR is perfect for the squad with regards to manueverability and accuracy. The SAW is inherently innacurate and is a “light machine gun”. The SAW will be maintained within the rifle companies (9 per Co.) so that each squad will have that capability if needed based upon the mission. My bet is that they will keep those guns in the fight. While I don’t disagree that the infantry could be fielded the IAR for the whole squad that’s a decision point that’s being looked at right now. The whole “sustained” fire issue for automatic fire without having a system to change barrels is also a moot point. I have “NEVER” seen nor advocated changing the barrel on the SAW when in the fight. Problems with that are that it is carried by a single dude. What’s he going to do with the hot barrel???? 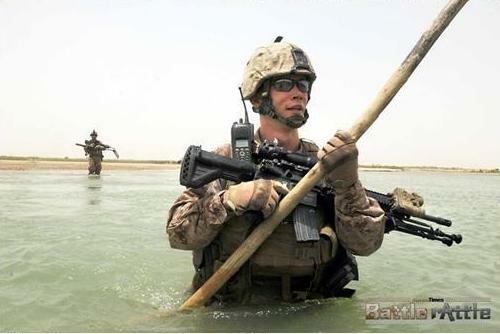 Marines don’t routinely change the barrel unless they are in the defense with the SAW. The SAW is an excellant “light machine gun” hence the reason they will have 1 per squad but it is most definately “NOT” an automatic “RIFLE”. Tactics changed “BECAUSE” of the SAW when it was fielded initially and by the way, when it was fielded it did not have a spare barrel….the spare barrel was added to the kit later. Remember 1 dude had to carry that thing. It’s a crew served weapon in reality just like the 240 but lighter. I have to laugh at the “firepower” issue. Just because the SAW has 200 rounds to fire means it’s better? Not really. Hits count. Suppression is hitting the bad guy not hitting the general area with a lot of rounds. Think about it and you’ll see that this is not only smart but truly adds capability to the squad. Continued: Second issue with regards to the SAW and tactics. As related earlier the SAW changed how squad conducted the assualt. Before the SAW squads did not routinely have an intermediate support by fire element. Remember that most squads are not really 13 guys. More like 10. SAW’s were not used to either clear trench lines or to clear rooms since that’s a decidedly bad idea with an open bolt firing weapon. They were given tasks normally associated to machine gun teams like issolating an objective. By doing that the squad had 3 less guns in the fight while clearing and in reality 4 since someone (normally a team leader) was put in charge of the 3 SAW gunners. This reduced the number of guys actually in the fight. Another problem with the SAW was in the assault. If you’ve ever seen a SAW guy trying to keep up with the rifleman you know the answer to this. First the SAW guy would get in a good position and start firing (normally one to three burst of fire) and he would be told to move. Then he would move and repeat…how much “good” suppression was he really providing? Reality was that he wasn’t. Just when he was getting adjusted to where the target/targets where he was required to move to maintain alignment with the assualt element. Come on….this isn’t that hard to figure out. Light machine gun vs auto rifle that retains the continuity of the squad, the movement of the squad is quicker and you have a weapon that has minute of angle accuracy out to 500 meters. Lastly the SAW will still be used by the squad as it was designed (as a light machine gun). Giving the squad not only three “more” automatic weapons but also a belt fed light machine gun fire capability. NOW…that’s all I have to say about that….Experts, yeah right. @Gunner- I was going to read your entire huge comment, but when I read the first part that said “the SAW is inherently innaccurate”, I stopped. The SAW is extremely accurate and the fact that you believe it isn’t proves my point that Marines need specialized training in shooting the SAW accurately. That comment also shows your inexperience with running the weapon system and therefore anything you have to say is kinda moot. @FormerSFMedic- Thank you for your response. The Marine Corps does have training (speciallized) to teach the SAW and how to engage with the SAW. It is fired mainly from a bipod but can be utilized with a tripod which increases it’s accuracy. The bipod is not the most accurate of methods to engage with a machine gun and furthermore Marines must engage with the assault modes of either standing, under arm, or hip. If you had read further you would have seen that I said that the SAW is an excellant “light machine gun”, but unfortunately you did not. As far as my experience goes, I was an infantrymen in the Marine Corps for 31 years. I served as a Machine Gunner, Rifleman, Platoon Sergeant, Company GySgt, Platoon Commander for a weapons Platoon, and finally as a Marine Gunner (Infantry Weapons Officer) from CWO2-CWO5. In fact I was the Senior Marine Gunner in the Marine Corps when I retired. I’ve served 4 tours in combat as an Infantrymen in Somalia and Iraq. I am a Combat wounded veteran, honored with the Silver Star, Navy Marine Corps Commendation w/V, Combat Action Ribbon and several expeditionary medals that I won’t list. I also served as a Combat Instructor as an enlisted Marine “teaching” machine gunnery, riflemen, mortar men, assaultmen, Anti-Tank Assaultmen, as well as Marine Officers conducting their training at The Basic School and Infantry Officers Courses. I am sort of experienced “BUD”. Go ahead put a fire team with a SAW and a fire team with an IAR on the same rush course and see who suppresses their targets the best(most rounds closest to target or on target) and moves through the course the fastest. Here ill save you the time the IAR will win every time. Not to mention when the team gets to the objective they will arrive more alive instead of exhausted. Nine months infantry platoon Vietnam. Not a professional soldier. (drafted) Went where they told me to. Did what they told me to. Never fought in the desert. Not expert on anything. Never cleared buildings. Everybody carried 60 ammo. We had two per squad. I carried 25 to 30 m16 magazines. To us firepower was survival. But I ain’t doing it now. Good luck. We love you guys. @gunner…You probably had your hand so far in this you could impregnate a cow. So…You probably resisited the m4. You probably had a say in the Pmag issue, I am assuming you resisted a course of fire with the optics attached for qualification. Yes I know who you are. yes we have served together, and YES I have stood in front of your desk and argued with you about some issues. Are you missed…sort of. But we need to get with it. USMC has approved many things that are comparable to a football bat. This is one. This is one that i feel the LtCol at ICE should put his papers in for approving. What can this do with a 16 in barrel. Why not shorty 7.62 carbines? The deep end swimmers have them. But then again we as marines will wait ten years before we try that. @Gunner Eater…Well that’s interesting. You know who I am??? Not really I think but that’s O.K. As far as the M-4, I was an advocate of getting it vice the M16A4 musket. Made sense at the time however with 3/2’s test and reliability problems we had to go with the M16A4. Now of course the M-4’s issues have been largely fixed. Unfortunately when we had to make a desision between the two right then (Gen Jones CMC at the time wanted the answer now not later). So I didn’t resist getting the M-4 nor did I resist the PMAG. I was also a strong proponant of getting the Optics on the course of fire for everyone since it’s stupid not to start training with them from the beginning. We had to go through two years of institutional bias and the Commandant (Gen Conway) to get the optics on the rifle for annual requal and are still fighting to get the optics on the rifle for entry level training. PM ICE had nothing to do with getting the IAR (PM Infantry Weapons IW did). I don’t disagree with getting a larger caliber (6.8 or 7.62×39) for the IAR but that also brings with it some other issues that I won’t go in to here. But you have to look at the weight and combat load issue more to determine that. Knock down power is huge when your muzzle to muzzle with a 7.62 x 39 so understand what your saying. I think your confusing who I am with someone else. Cheers. Did you realize something? The attachments are the same, ACOG, PEQ and bipod. You can talk all day on pros and cons of both the IAR and the SAW but what it boils down to with me is the IAR dates the M16 platform. Everyone here knows the past of the M16 from the A1 to A4 and now the M4 it has made improvements in leaps and bounds. What the IAR will show is the next step gas piston over direct injection. I think a variant of the IAR perhaps with only semi auto and burst should be the standard rifle for every member of the squad. Piston upper is better/more reliable than blowback. Funny how we are going full circle back to the AR gunner with an m-16 in Vietnam. This rifle is a better gas piston version of an m-16. I agree having semi and 3rd burst is better than full auto…you can pull multiple 3rd bursts real fast anyways. There needs to be a higher capacity magazine of some type that is interchangeable with standard mags. As for the barrel…I saw an m-16 A1 barrel warped almost 90 degrees upon redeployment from Panama after we got Noreiga….Ranger Regimental Recon member or other regimental level guy. I will not judge him for firing that many rounds in that short a time to cause that level of worping…but I wonder how many rounds can be fired quickly/fast in a short period of time through this new weapon before it does the same thing? SAW is soo big and heavy for just firing 5.56 mm ammo. I agree that a lighter more accurate weapon, even if not belt fed, that is more reliable than an m-4 is a great idea. I just hope and pray that no politics were involved in replacing the SAW because it will not mean just an “oops” for the Corps it will mean Marines’ lives. I don’t understand some of the comments here such as SAW gunners not being used to clear bunkers or buildings as we did it for years. What most Marines’ gripes were was the extra pounds they had to carry especially when you did not have to fire the weapon and continued to carry the original amount of ammo. I would rather have to tote that extra weight than not have to carry it and not have enough ammo or fire power in a fire fight. A lot of these Marines are so physically tiny nowadays that they can barely carry their combat load without falling over and I just wonder if that had something to do with the weapons change. Come on Devil Dogs lift some weights and stop worrying so much about the pull-ups, Crunches, and run to show that you are in shape. Obama is not a socialist. However, pragmatism requires that we realize that there is a diffrence between some theories in a book and actual practice. There is no capitalism which does not have some regulations and limits. We tried that old inflexable adhearance to the ideology of the multinational corporate “entities.” After 30 years of it, we should have learned; “trickle down” really means piss on the middle class. Drop 4x m249 so Marines are free to adopt the M60E4 with short barrel for assult, & the No2 with long barrel & ammo for sustained fire support. I was a Sgt Squad Leader when the M249 was first adopted, and in spite of it’s many flaws it was a significant improvement over the use of M16’s by the fireteam automatic rifleman. But as pointed out, in the assault no one changes barrels on an M249, so the lack of ability to change them on an M27 is irrelevant. In the defense, most of the time the SAW gunner didn’t have a spare barrel to swap, so again pretty much irrelevant. Ok, losing the 200 round belt for a 30 round magazine hurts a bit, but not that much. As unlike TV and movies no one but a total idiot fires more then 3-to-5 round bursts. So you have to swap mags every 6-to-10 bursts vice every 40-to-70 … know something, it’s faster and easier to swap a magazine vice load a new belt. I’ve never seen a magazine tangle or hang-up like belts do. If the fireteam automatic rifleman can move with the rest of the team, put effective suppressive fire where it’s needed, when it’s needed, what more do you want? If you’re one of the “volume of fire” crowd that thinks tossing massive amounts of lead downrange is all that matters why not issue everyone a gattling gun and a pickup to carry ammo?